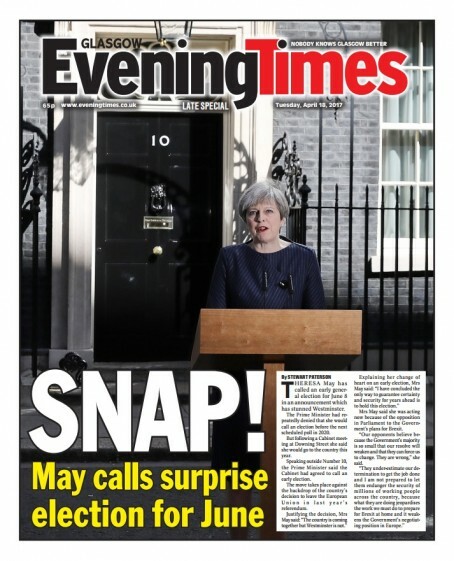 Two Scottish dailies are believed to be the first UK newspapers to share the announcement of a snap General Election in print – less than an hour after the news broke. The Aberdeen Evening Express included the news in its city final edition after Prime Minister Theresa May announced at that the country would go to the polls on 8 June this year, subject to the approval of two-thirds of MPs in a House of Commons vote tomorrow, while the Glasgow Evening Times ran a special edition. The ET’s late special went out to 10,000 Evening Times readers who get their copy home delivered. The edition was ready to go with just four minutes to spare before deadline at 11.26am, while the Evening Express sent its edition 10 minutes beforehand. Evening Times editor Graham Shields said: “As soon as we heard the Prime Minister was to make a special announcement, and it was expected to be the call for a snap election, we set the wheels in motion to accommodate the news in a special late edition for our 10,000 home delivery customers. “With the PM due to start talking at 11.15 we knew it was going to be tight, as our latest off stone time for this type of thing is 11.30. “Fortunately, Theresa was itching to get going and she came to the rostrum a bit early, so we were able to send a front page with live picture and short quotes story by 11.26. 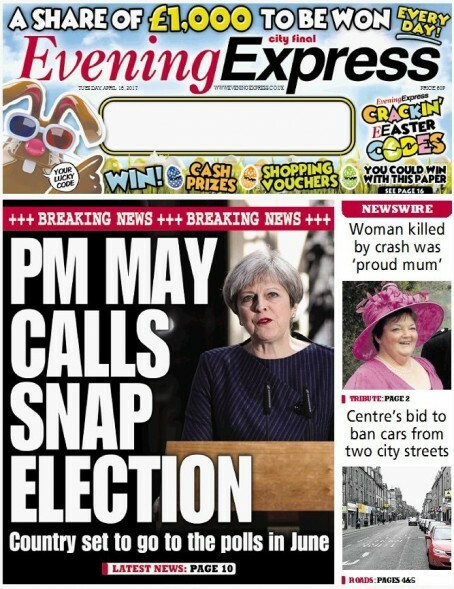 Evening Express editor Alan McCabe said: “Our city final edition was on the press within minutes of the Prime Minister delivering her speech. Calling for the election, Mrs May said she feels she needs a new majority in Parliament ahead of the looming Brexit negotiations. The Fixed Term Parliament Act passed by the Coalition Government states the next election should not be held until May 2020. In order to overcome this, Mrs May will tomorrow move a motion in the House of Commons calling for an election – which requires a two-thirds majority to pass. Evening papers printing today’s news today? It’ll never catch on. Good work to all involved, though. Shame there’s so few of them that can do it that it becomes industry news. Well done to these two evening titles, this is how it should be covered, an evening paper carrying the latest possible up to the minutes days news, sadly so few evening titles are produced during the day any longer, by the time it hits the press it’s for a morning daily then is no longer news. Nice, but isn’t the Easter bunny at the top of the masthead a little late? Old news? That used to be the fun of working for a proper evening paper, breaking national news the day before the nationals. This was a great effort, but of course was actually scooped by web coverage elsewhere, which the old evening papers did not have to worry about. All the same, good stuff.